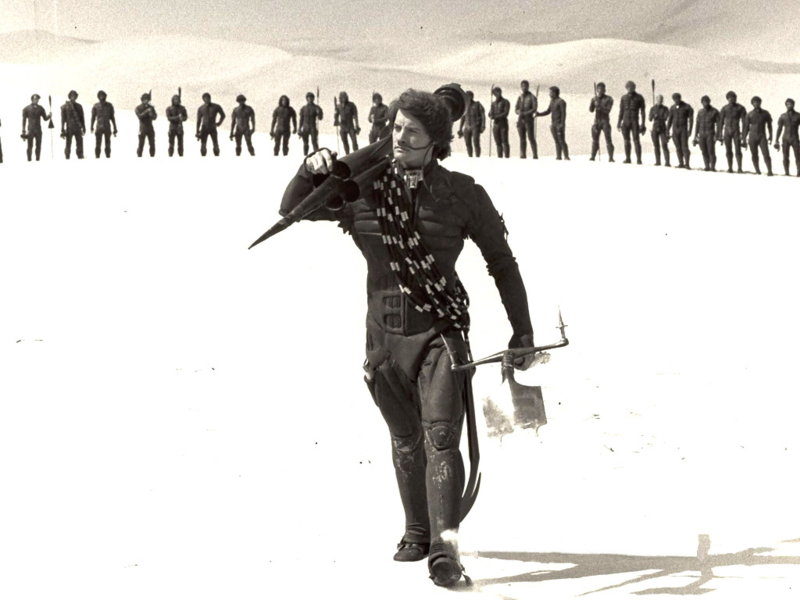 Bill Bryan designed the stillsuits for the movie David Lynch’s film adaptation of “Dune.” Image courtesy of xataka.com. With his grandfatherly beard and relaxed disposition, Bill Bryan could be anyone you’d meet on a park bench. But you wouldn’t imagine that he’s the designer of effects for some well-known movies such as “The Village,” worked as the puppeteer behind the killer doll Chucky in “Child’s Play,” and wore the suit of the Stay Puft Marshmallow Man in “Ghostbusters.” Bryan is a natural storyteller, and his experiences make for riveting listening. Fortunately, you don’t have to chance a meeting with him on a park bench to hear some of his stories. He agreed to an interview with Legendarium Media at Mad Monster Party 2017 in Rock Hill, SC. Legendarium: I was struck by your artistic background growing up, and it sounds like you had quite an adventure trekking from the East Coast to LA. Bill Bryan: Oh, yeah, my bicentennial rocket thump? Across the country and up in freights to get all the way. When you get to the desert, nobody wants to pick you up, so I thought I was going to have to take a bus out of Grand Junction, and somebody said, “Hey, just come with us to the freight yard.’ So, we went on down there and they said, “Yeah, we’ll show you how!” So, we hopped onto a boxcar and [it] took us across the desert. Legendarium: So you hooked up with Elton John’s show as one of your earliest gigs? Bill Bryan: Well, I was working my first job, it was a company called Fantasy Fair, where they were making Woodsy the Owl and just various walk-around characters, you know Smokey the Bear, things with that in the middle. . . .Elton John, contacted them, wanted a banana costume for his show, and so that was one of the first jobs I did when I got to LA: I built a banana costume. 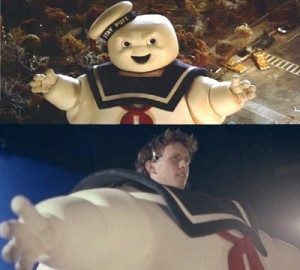 Bill Bryan in the Stay Puft Marshmallow Man suit on the set of Ghostbusters. Image courtesy of beyondthemarquee.com. Legendarium: Eventually you worked with “Dune,” could you elaborate on what you did with that and did you meet David Lynch? Years later, Val Kilmer came into XFX where I was working and it was for “Mars: Red Planet,” I guess, and I walked up—it was in the break room before his body cast or after—anyway, I said, “So, did you ever wear a stillsuit?” And you know how when Homer chokes Bart [on “The Simpsons”]? He did that to me. He said, “YOU COST ME THAT JOB!” He was all jokey of course. Then he laughed and said, “Kyle and I, we always laugh about that when we get together,” because you know, obviously, his career took off anyway. I didn’t really destroy him or his career. Bill Bryan: Yes, yeah, yeah, “Twin Peaks,” [and] what was it, “Blue Velvet?” So many, yeah. Legendarium: Do you have any advice for any upcoming effects designers?